This cinnamon raisin sourdough bread is wonderfully light, fluffy and chewy. But toasted it is downright irresistible! Delightfully crispy with chewy raisins and the warmth of cinnamon – it’s pure heaven! I LOVE bread. All kinds. And while I don’t allow myself to indulge very often, especially white bread, when I do it has to be good bread to make the indulgence worth it. 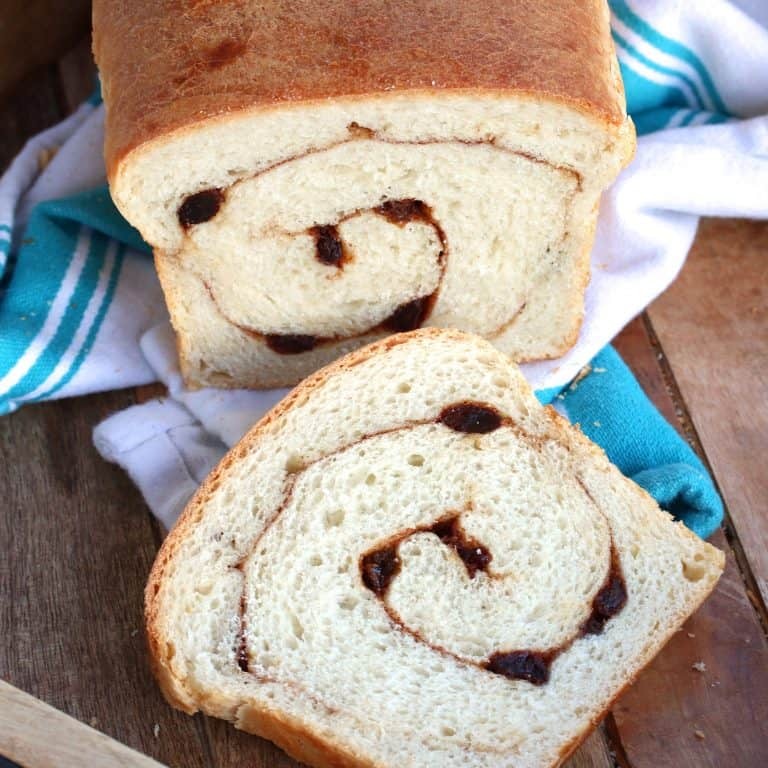 I can tell you, this Cinnamon Raisin Sourdough read is a worthy indulgence! A terrific texture and flavor, it has a soft and fluffy interior with a lightly crunchy exterior and just the right amount of chewiness when you bite into it. If you’re eating this un-toasted, as with most homemade breads it’s best eaten within a day or two. But if you’re using it for toast (the way I enjoy it best), its shelf life is a little longer and you’ll probably want to make a double batch and freeze it so that you have some conveniently on hand when the craving comes a-callin’. Make sure your sourdough is fed and ripe. Place all the ingredients (minus the filling ingredients) in a stand mixer fitted with a dough hook (or use your hands) and knead for about 5 minutes to form a soft dough (at least 10 minutes if kneading by hand). Place the dough in a lightly greased bowl, cover loosely with plastic wrap, and let it rise in a warm place for 60-90 minutes or until doubled in size. **Prepare the filling in advance by combining the sugar and cinnamon in a bowl and beating the egg and water in a separate bowl. Punch the dough down and transfer it to a lightly greased work surface. Use your fingers to evenly spread the dough into a large rectangle about 6×22 inches. Generously brush the top with the egg mixture. Evenly sprinkle the cinnamon sugar over the dough followed by the raisins. Roll the dough into a log, starting with the short end. Pinch the long seam to seal it and pinch both ends to seal them closed. Generously butter a 9×5 inch loa pan and place the cinnamon bread in it with the seam down (smooth side up). Very loosely cover it with plastic wrap (just lay it over the top) and let it rise in a warm place for another 60-90 minutes until it’s risen 1 1/2 to 2 inches over the rim of the pan. 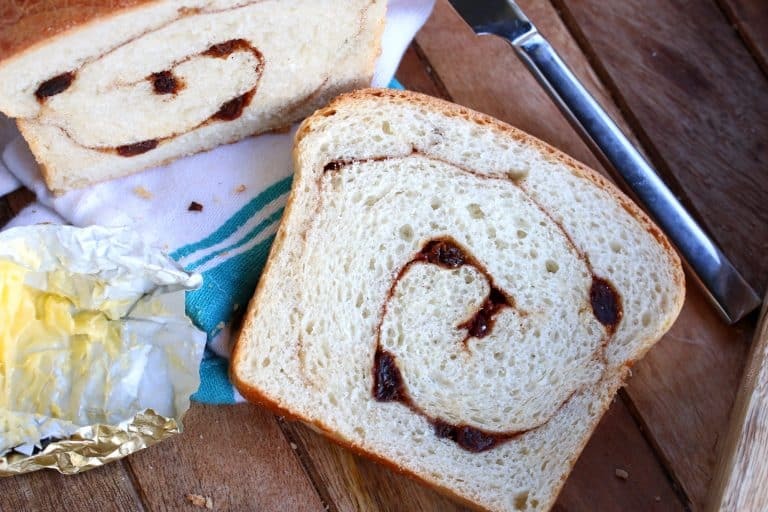 Bake the cinnamon raisin sourdough bread in a preheated oven at 350 degrees F for 20 minutes, then loosely tent it with foil to prevent the crust from burning, and continue to bake for another 20-25 minutes. The bread is done with the crust is a dark golden brown and the internal temperature is 190 degrees F. If you bake bread regularly you should definitely get an instant read thermometer – it’s inexpensive and keeps you from having to guess whether or not your bread is done. Gently run a butter knife along the edges of the loaf pan and turn the loaf out of the pan. While it’s still hot, brush the surface with some melted butter. Let the bread cool completely before slicing it. This bread freezes well so make an extra loaf while you’re at it. 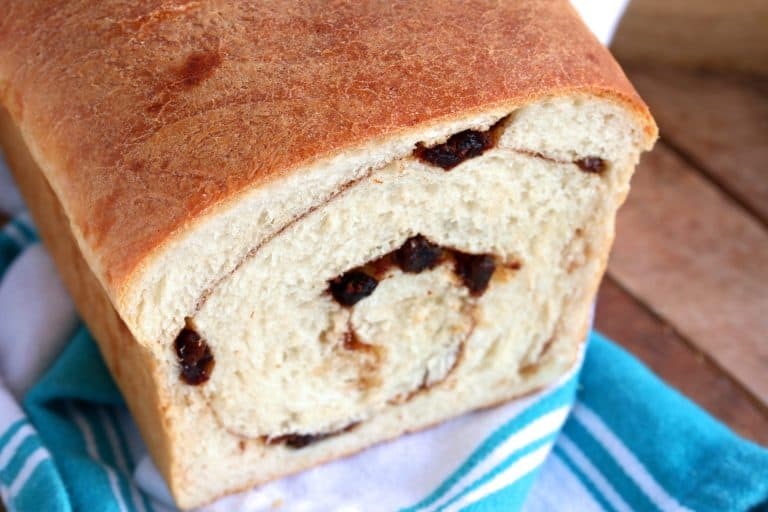 Our favorite way to eat this cinnamon raisin bread is toasted. This makes the best cinnamon raisin toast EVER! 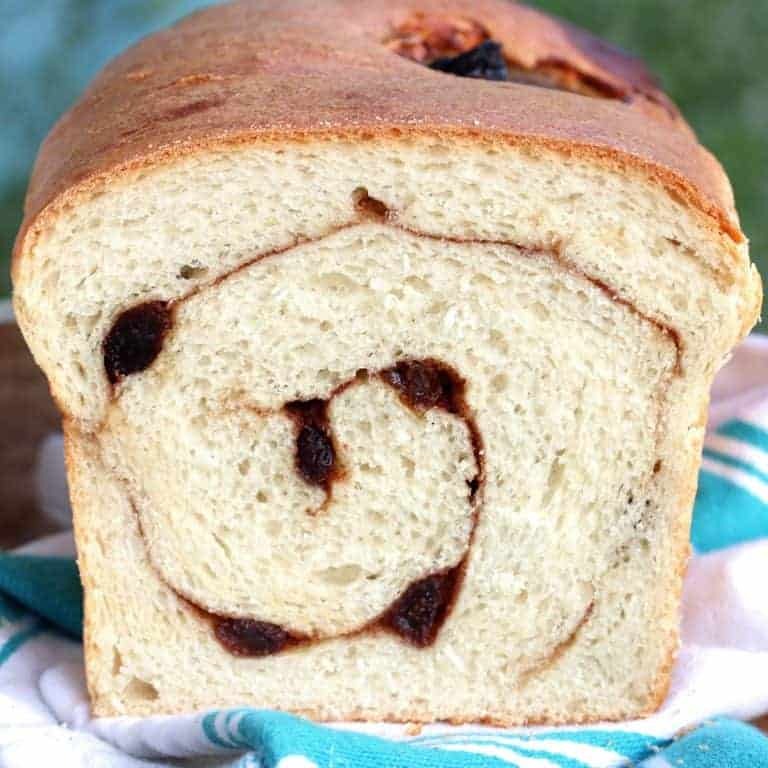 This cinnamon raisin sourdough bread is wonderfully light, fluffy and chewy. But toasted it is downright irresistible! Delightfully crispy with chewy raisins and the warmth of cinnamon - it's pure heaven! Place the dough in a lightly greased bowl, cover loosely with plastic wrap, and let it rise in a warm place for 60-90 minutes or until doubled in size. Punch the dough down and transfer it to a lightly greased work surface. Use your fingers to evenly spread the dough into a large rectangle about 6x22 inches. Generously brush the top with the egg mixture. Generously butter a 9x5 inch loaf pan and place the cinnamon bread in it with the seam down (smooth side up). Very loosely cover it with plastic wrap (just lay it over the top) and let it rise in a warm place for another 60-90 minutes until it's risen 1 1/2 to 2 inches over the rim of the pan. 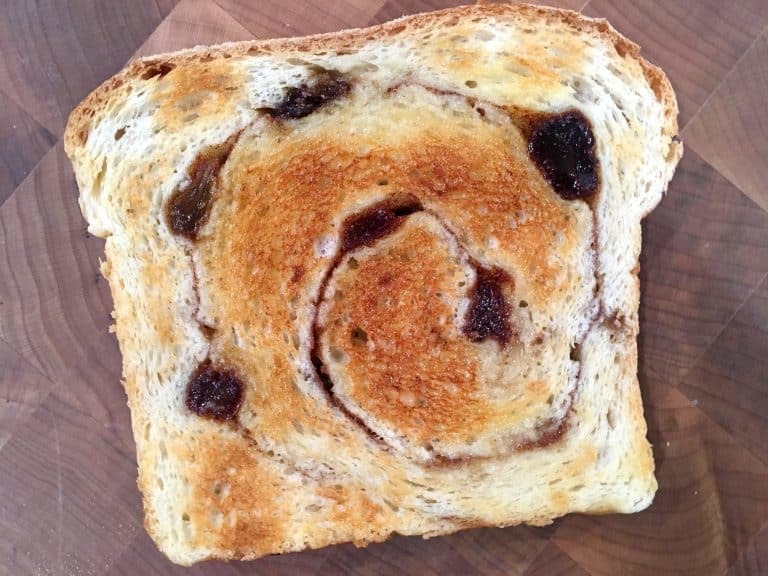 Bake the cinnamon raisin sourdough bread in a preheated oven at 350 degrees F for 20 minutes, then loosely tent it with foil to prevent the crust from burning, and continue to bake for another 20-25 minutes. The bread is done with the crust is a dark golden brown and the internal temperature on an instant read thermometer shows 190 degrees F.
Once the bread is done baking, gently run a butter knife along the edges of the loaf pan and turn the loaf out of the pan. While it's still hot, brush the surface with some melted butter. Let the bread cool completely before slicing it. This bread is absolutely PERFECT for toasting! how do you make the sourdough starter? Hi Rose, there are literally hundreds (at least) of recipes for it online – just do an online search for “how to make sourdough starter” and you’ll have tons to choose from, but it’s the same basic procedure. I like the sound of this bread very much but I have yet to make a satisfactory starter! They always get sour and watery, I have no idea why. Does anyone sell a dried starter? Hi Toffeeapple, yes, you can purchase it – I just did an online search for “dried sourdough starter UK” and there are a number of websites in the UK that carry it. I saw there are even a couple of bakeries in Liverpool that give it away free, so you may even have some luck asking your local baker in your area if they can spare a little. Thank you for that – it didn’t occur to me to look online – blame my advancing age! Thank You very much for getting back with me !!!!! IF you have sourdough starter why do you need the yeast as well? Hi Bernice, that’s a great question – it’s simply to speed things up. If you’re using strictly sourdough it’s a two-day with an overnight rise and then repeated folding/kneading every 30 minutes, every 2 hours, then every few hours, and so on. 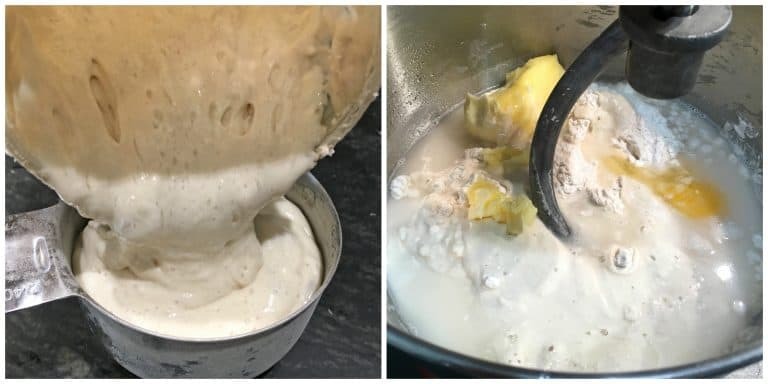 By going the latter route you get the full benefit of the sourdough but the addition of yeast makes the break-making process shorter and easier. RIght.. thanks for the quick response.